I came up with the concept a decade ago, when I had wide-legged jeans and a fish and lived in the basement of my best friend’s condo. I hocked up a 42,000 word rough (I’m talking cat tongue sandpaper rough) draft as part of NaNoWriMo in 2011, and it was so bad I had to step away from it for a while. I resurrected it last summer in an effort to get both the book and my writing practice off the ground again. And then in January I started GrubStreet’s Novel Generator to really take a run at this thing in earnest. I am in a compulsive long-term relationship with this novel, and it has never once cooked me dinner or moved my car on street sweeping day. But I am still somehow hopelessly committed to it. That said, my writing summer was a roller coaster. I was stuck on a section of my book for a while, and couldn’t figure out what came next. I was also doing too much editing and cleanup of previous pages, and not enough word-vomiting up of new ones. But mostly, although I had a respectable writing practice going on pre-July, all of a sudden there were all these barbecues and beach days and trips and long warm sunny afternoons, and the thought of hunching over my manuscript for hours was dismally unappealing. But that’s okay. Part of writing is stepping out of your imaginary world and living out in the real one to refill that creative well. Or at least that’s what I’m telling myself to justify all those fizzy gin drinks I sipped on porches instead of hitting my word count goals. Then my writing class ended just as that annual autumnal back-to-school vibe started to hit, and now I have more time and renewed focus. I’ve been making some progress again. I do miss class though. GrubStreet’s Novel Generator is a must. (If you’re an aspiring novelist. If you’re not, you’ll probably be very confused. “Um, I came for a sushi rolling lesson, what the hell is a denouement?”) I learned so much about craft and process and my own book and writing skills during the last nine months. I met a group of amazing fellow novelists I have no doubt will all have their work on bookshelves one day. I took copious notes during lessons. I knocked my concept down to the studs and kind of started over. I workshopped 40 pages and had another 20 professionally edited by our rock star instructor. I practice-pitched my book to an agent. I read my work out loud in public at a book reading and didn’t pass out in panic. I crossed the 30,000 word, 100 page threshold, and I know my ending. And although I still have a long road ahead before I finish my first draft, I feel like I have everything I need to get there: knowledge, community, and probably most importantly, confidence. I pretty much almost feel like I’ve maybe got this, which, OK, doesn’t sound that confident, but is truly a major mindset improvement. Novel writing is a marathon during which you have to continually convince yourself you can and should keep trying to get to the finish line, on the blind hope that when you get there you’ll find orange slices waiting. (Or whatever motivates you. Maybe it’s just the knowledge you did it. Or puppies. Honestly, if more actual marathons ended in puppies I might try one.) Anyway, if I do get there with this book, it will only be because this place and these people helped me do it. 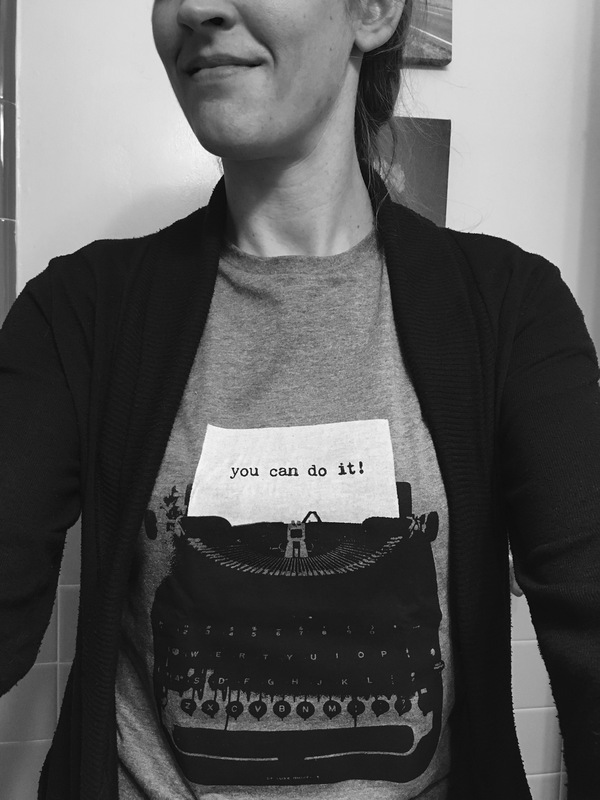 I picked up the perfect shirt for novel finishing from The Sneaky Penguin. In the meantime, my new self-imposed deadline for my first draft is March 1st. Hold me accountable. If I don’t hit the mark, I expect to be tarred and feathered and marched through the town square. (Or at least marshmallowed and cat-haired and gently encouraged to keep going.) If you check in along the way, you’ll find me sipping those fizzy gin drinks at my desk this time. If you’re really serious about motivating me, bring puppies. < Previous must be this insane to ride. Next > what have you been up to?